Red-shouldered hawk, photographed at Green Cay Nature Center, Boynton Beach, Palm Beach County, in January 2015. Red-shouldered hawks, Buteo lineatus, are probably the most common raptor in the skies above South Florida. They can be seen in and near swampy woods and even in the 'burbs throughout the region and throughout the year. But despite their familiarity, they remain as magnificent a sight as if seeing one for the first time. This is mostly a bird of eastern North America, with the greatest portion of its population within the United States. It is largely nonmigratory, and Florida has a year-round population of resident red-shouldereds. But there is also a small percentage that do move to the northern U.S. and southern Canada to breed each summer and winter, and return south to Florida and Mexico. There's also a population of red-shouldered hawks that live along California's coast, south into the Baja Peninsula of Mexico. 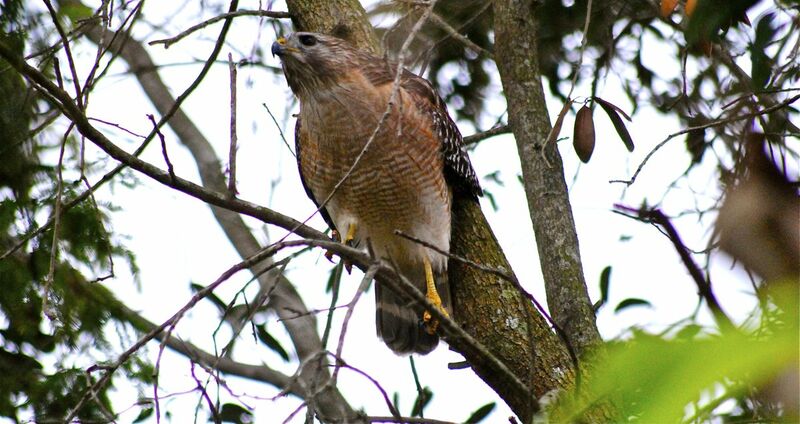 Red-shouldered hawks are large birds, with a body length of about 2 feet and wingspan of more than 3.5 feet. Females are larger than males but otherwise males and females look alike. Their wings are a dark-and-white checkered pattern; the chest is reddish brown and the tail is square and marked with distinctive horizontal dark and white bars. 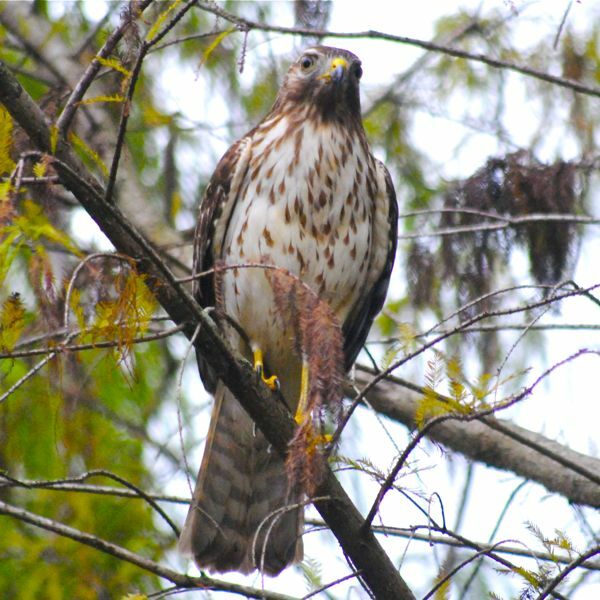 Cooper's hawks are similar, but their wings are more of a solid gray and the tail is rounded rather than squared. There are five subspecies of red-shouldered hawks, with one being the west coast version, isolated from the rest, and another being a South Florida version that is paler than the others found in the east. According to Partners in Flight, there are 1.1 million breeding red-shouldered hawks worldwide, most of which are found in the U.S. They rate a "least concern" from a conservation standpoint, but they can be rare within their range. In New York for example, Red-shouldered hawsk are considered a species of greatest conservation need. Even there, however, the population is increasing rather than diminishing. Red-shouldered hawks are territorial; some will inhabit — and defend — the same territory year after year, sometimes even refurbishing the same nest they used the year previous. They will also use the nest of another species on occasion. Red-shouldered hawks pairs are monogamous throughout their life, but will find another mate if if one dies. Both male and female take part in building a nest made of sticks and lined with softer material, including moss and leaves. Hardwood trees that provide good cover are preferred, but they will use conifers as well. Nests, which can be as big as two feet across, are built about two-thirds up from the ground usually in a fork along the main trunk. Breeding season in Florida is January through May. They have one brood a year, with the female laying a clutch as large as five eggs. The eggs incubate for as long as 40 days, with mom handling most of the sitting duties; the young remain in the nest for as long as 50 days. Mom stays with the young for one to three week, while dad fetches food and feeds the kids. According to Cornell Laboratory of Ornithology, red-shouldered young have the ability to eject their poop out of the nest when they're five days old. Both parents will continue to feed their offspring until they're able to live on their own at about five months. They become sexually mature at two years, and can live as long as 19 years. Dinner (and lunch and breakfast) is either a small mammal, snake (photographed at left), lizard, toad, frog or, on occasion, a bird. They usually hunt from a perch, scouring the ground before swooping in and snatching their prey. They do, at times, hunt while in flight. 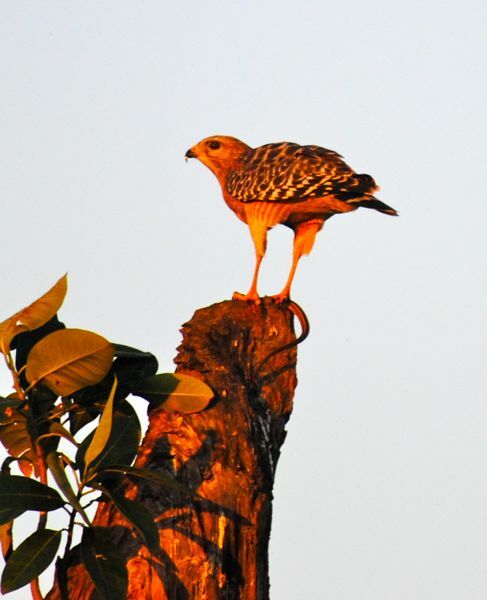 According to the Florida Fish and Wildlife Conservation Commission, two of the five subspecies of red-shouldered hawk are found in Florida, with Lake Okeechobee generally being the geographic dividing line between the two. B. l . alleni is the subspecies found from the Panhandle to Lake O; B. l . extremus is found from the lake to the Keys. 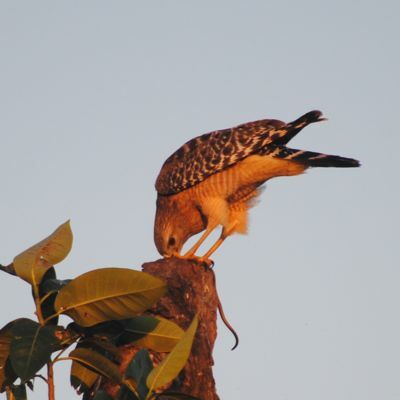 The biggest threat to red-shouldered hawks is loss of habitat. Red-shouldered hawks are members of Accipitridae, which includes other hawks, eagles and kites.